fanastic product, and not too pricey for size and quality I really can't fault this in any way. Even heat distribution from heavy gauge 2.5mm copper combined with robust stainless cooking surface, so no worries about melting tin in the cooker. I can see no benefit of tin, though I do have a couple of tin-coated pans - the conductivity of copper is what avoids hot spots and burning rather than any magic of tin. For such a large and high quality item, the price is reasonable, compared to (say) one of the Orange coloured iron pans one could mention. 1028 customers found this review helpful. Did you? Yes, I did! Perfect family pot! You can use it for practically anything; from boiling pasta, to making brilliant stews. In fact,a soup is cooking away in it right now,as I'm typing this review. Excellent product! 1020 customers found this review helpful. Did you? Yes, I did! Solid well made casserole This casserole is likely to be the last one you will ever need to buy. It is large enough to cater for any eventuality. It will also be the centre of attention on the dining table. Big enough and attractive! Finally, a pan to cook in AND serve in for the extended family! No transferring from a scruffy old casserole to serving dishes for the table (even if my other half has to lift it for me!). Another attractive, effective, completely wonderful pan from Falk - our collection is constantly growing. Thanks again for the excellent customer service. The mother of all casseroles! We used it for cooking Middle Eastern cuisine, and what great flavors the food had, the size is perfect for a family, and it looks beautiful in the kitchen! 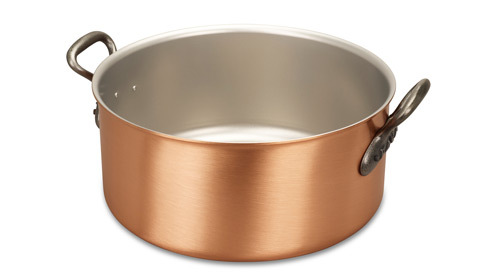 28cm Copper Casserole Review I like the conductivity of this copper pan and it seems the product will be durable. However, the only concern I have is the way the exterior shinning copper faded away.